Whether you’ve been blending for a while or are new to the benefits of essential oil, we can all agree that there are settings outside the home that could use a dash of health, healing or bug control! The spray bottle collections listed below can help you put together your favorite oil blends so you can take them on the road. What are the advantages/Benefits of using spray? Why do you need spray bottles? How to choose your spray bottles? Conditions from migraines, general stress or far too many mosquitoes in your general area can be treated with a spritz of the right blend of essential oils. Once you have a great blend that works for your personal needs, you need to make it airborne! Whether you’re working to reduce anxiety, combat allergies or merely sleep better, increasing your knowledge of essential oils and their capabilities is a natural and straightforward way to improve your health and the health of your family. You may have a mister or other dispenser at home, but great oil blends can work in any environment. If you have an oil blend that helps boost your powers of concentration, put it in a mister bottle and take it to work! Traveling with a small sampling of your favorite oil blends can make life easier. Whether you’re fighting mosquitoes and ticks or just trying to calm the atmosphere around you, a spritz of the right oil blend can help. How many bottles do you plan to transport? How big is your purse or tote bag? If you’re flying in the states, take care to stay under the 3.4-ounce limit imposed by Homeland Security. It’s frustrating to have to toss your toothpaste, but having to discard a bottle of your favorite essential oil blend would be a terrible waste. Your bottles will also work well for home use. When making your selection, be aware that your oils can be blended with cleaning products in a larger bottle, or in smaller containers for a custom air freshener. Small bottles will also work well for natural perfumes and body sprays. Choose something you find pretty. Life is too short to be anything but beautiful. Secondly, if you plan to carry more than one bottle, consider a set with labels to save confusion. Finally, make sure your oils will be protected from the damage caused by dirt and dust, and try to get products that offer UV protection. It’s also important to consider where you’re blending your spray. There’s a fair bit of critical measuring to do for the right blend, so if you’re mixing in the bottle, be sure to invest in containers large enough to make it easy to count drops and make your favorite blend. Below a video with good advices on how to create your own fragrance. ADJUSTABLE and DURABLE NOZZLE - Fine Mist and Jet Stream. 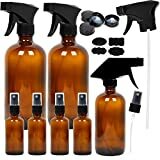 If you like to add essential oils to your cleaning products, this set is an ideal choice. Not only can you add your favorite oil blends to personal spray, but you’ve got two additional glass bottles for mixing your own cleaners, linen sprays or non-toxic bug spray. This set comes with everything you need to get your favorite blends airborne! There are 4 2 ounce bottles, ideal for a traveling mix. Each has their cap to seal the container for a good shaking, and there are chalk labels with excellent sticking power so you can tag your best blends. 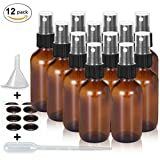 If your oil blends need to be easy to pack and travel with, then this set of 6 10 ml bottles is an excellent choice. Each container holds .35 oz of liquid and has a screw on top as well as a dust lid. It should be noted that these bottles don’t come with labels, so you’ll need to make an additional investment. 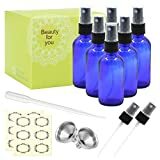 Users find that these tiny bottles work well for essential oils and for infused waters. If you’d like to carry your favorite calming or energy lifting blend with you to work or on a trip, these bottles are a great purchase. Finally, once you’ve got them loaded and sealed, you can be pleased that there are no complaints about leaking. If you’ve ever had your purse damaged by spilled scent or lotion, no worries! These carefully made little glass bottles don’t leak. Of course, once you have a great set of blended oils for yourself and your family, you want to be able to take it with you! This collection of 12 amber bottles will make transporting your favorite blends a breeze. This kit also comes with chalk labels for quick and easy marking. The Olilia set of bottles also offers you the chance to mix your favorite blends right in the container. This set comes with a mini funnel and pipette for measuring and loading both your carrying oil and your blend of essential products. These sprayers are ideally suited for room sprays and other ambient applications. The sprayer tips create a fine spray of mist to scent a room or send bugs running. Some users find that the spray tips don’t handle citrus oil well, so if you use citrus oil in your blends, you might want to test drive just one combination to make sure the spray tips can handle your product. If you’re ready to invest in new bottles or your first spray kit, this Mavogel collection is a terrific choice! In this kit, you’ll find two pipettes, two metal funnels, and 14 total spray misters and caps, in case you find one that doesn’t give you the most quality you need. These lovely blue bottles are just under 5 inches tall with mister and cap. Depending on the size of your purse, you may not be able to carry more than one, but you can confident that these bottles won’t leak! Also included in this set are 12 labels for marking your favorite blends. Your oil blends will be protected against dust and harmful UV rays wherever you go. Your oils make your life better and easier. You can use them to freshen the atmosphere around you, fight bugs, reduce headaches, calm you down or perk you up! No matter what your goal is, blending custom combinations is a great way to gain a bit of control over your environment. Once you’ve got great oil blends working for you, these bottles make it easy to take them along! Please let us know if this article was helpful to you. Feel free to share and comment.